Usually when I take my children out foraging with me, they like to muck in and tend to eat half our booty before we get anywhere near home. But not this time. No, the idea of harvesting stinging nettles from the woods near our home last weekend really did not appeal to my little ones, who preferred instead to build a den and climb trees. Quite sensible really. So their eccentric mother was left on her own to gather the nettles, protected of course by a pair of thick gloves. This was the first time I’ve attempted nettle soup. The idea of making a meal from a free and plentiful plant, almost as abundant in the town as it is in the country and generally considered a weed, has always appealed. And this is the time of year to bag your nettles, early spring. The fresh, young growth is the crop you want. By the end of April, nettles start to get a bit tough and are definitely best eaten before they flower in May. Aim for the young shoots and tips of the plants. 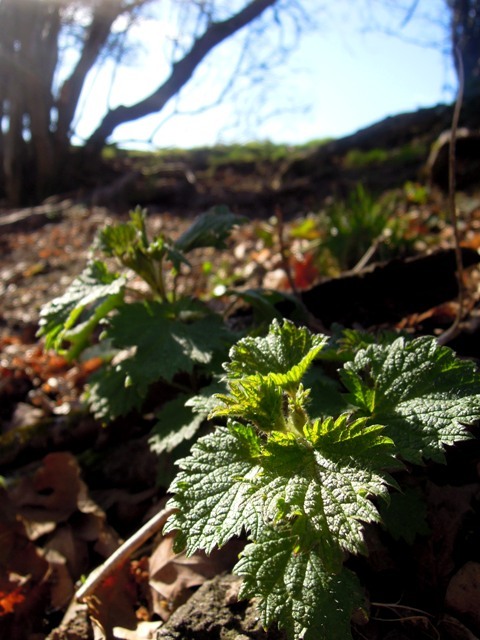 As I was harvesting my nettles, with the welcome and much-needed rays of spring sunshine on my back, I was surprised at just how fragrant the plant is, quite floral and herb-like. If it weren’t for that pesky sting, I’m sure nettles would be insanely popular. I must admit though, their smell does alter a little on cooking. As I dished up, my husband frowned and sniffed, and asked whether there was anything fishy in the soup. I shook my head and told him he must be imagining things; I didn’t want to put him off more than he already was. But I must admit there was the slightest fishy whiff. Please don’t let that put you off. 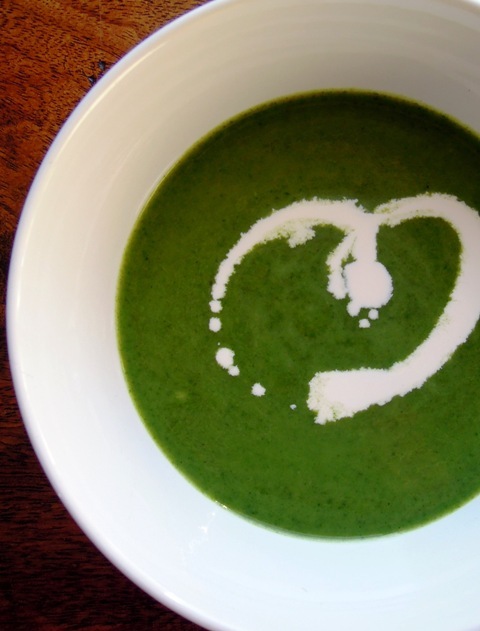 The soup is delicious, with a deep flavour similar to spinach, but more earthy and greener somehow. And there is not the slightest hint of a sting, I promise. As soon as the spinach hits hot liquid, the sting disappears. 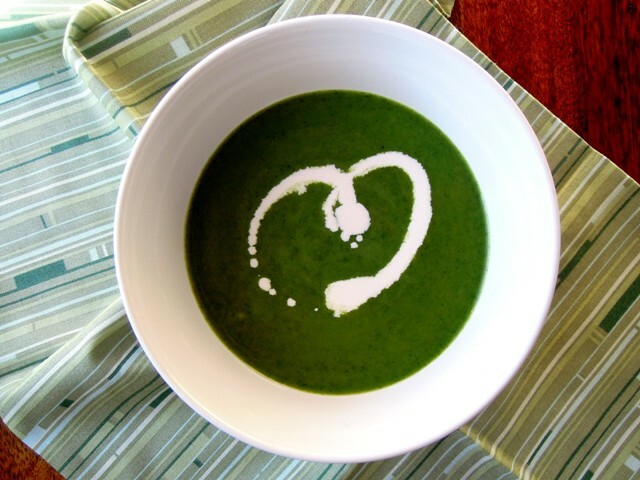 I was pleasantly surprised my lot took to nettle soup so well; definitely one to make again. Fill your sink with water and, wearing rubber gloves, thoroughly wash the nettles and get rid of any tougher stalks and unwanted creepy crawlies. Gently heat the oil and butter in a large saucepan and add the onion, leeks, potato and celery. Cook for around 10 minutes, stirring occasionally, to soften the vegetables. Add the garlic and cook for a couple of minutes before pouring in the stock. Bring to a simmer and cook for 10 to 15 minutes until the potato is tender. Add the nettles to the pan and stir into the soup as they wilt. Simmer for a few minutes and then blend in a food processor or with a hand blender. Season with salt and pepper and serve in bowls topped with a dollop of yoghurt of a drizzle of cream. I’m entering my nettle soup into No Croutons Required, the monthly vegetarian soup and salad challenge hosted jointly between Jacqueline from Tinned Tomatoes and Lisa from Lisa’s Kitchen. And as it’s very much a springtime soup, I’m also entering it into Ren Behan’s Simple and in Season challenge, which this month is being guest hosted by Michelle at Utterly Scrummy. Finally, I’m entering it into the Four Seasons Food challenge, hosted by Anneli at Delicieux and Louisa at Eat Your Veg, where the springtime theme this month is Celebrate Vegetables. I’m so impressed that you go foraging with your daughters, what a wonderful thing to do together. I love nettles, and put them in everything at this time of year. I even use them as a side dish; like spinach, only tastier. I’m impressed too – something I’ve always meant to try but never have. I did once eat stewed nettles on a survival course (don’t ask) and they were a bit furry and strong-tasting – must have been later in the season. I have never eaten nettles! This soup looks lovely though. What an incredible colour!!!! I’ve never had nettle soup. In fact I don’t think I’ve ever eaten nettles full stop. I’m intrigued though and love the colour! Aha! Another nettle convert! Great to see, recipe sounds delish. Such a gorgeous colour and it looks like you had fun collecting them. Thanks for submitting them to No Croutons Required. The roundup is now live.